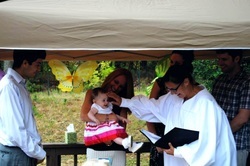 This is a beautiful blessing that includes a water blessing, Christening of name, Godparents and Grandparents. Welcome friends and family! Today is a very special day for all of us. It is a day in which we celebrate the birth of this child Myla. What you are all about to witness here today is truly a celebration of love, and of life! As Myla is here today, she is new and perfect, with no need of fixing nor cleansing. She is a gift. Her smile, her laughter, and her presence enrich the lives of all who know her. Only half way through her first year here, 6months old, and already she has made the world a better place. This child is our future and represents the light of the world. Kyle and Melissa have honored all of you today by inviting you to not only witness this beautiful welcoming ceremony, but most importantly, to participate in the blessing of this child. Today we simply give thanks and celebrate all the many wonderful blessings Myla brings and do our best to remember, and be thankful for, the very special role that we all have in her life. This event is shared, if in a different way, by those who are no longer with us physically but are here in spirit as we celebrate this joyous occasion. Kyle and Melissa acknowledge and honor the bloodlines, the history and the people who have all gone into the creation of Myla. They remember what it felt to be with these loved ones, and that through shared memories Myla may come to know her ancestors and the lineage that is her birthright. Melissa and Kyle chose the name Myla because it is the perfect combination of Melissa and Kyle hopefully getting the best of the two of us. Brinn has the meaning of a 'noble defender' and their wish for Myla is that she will always stands up for what is right and her beliefs. Myla has honored you by choosing you as her parents. Therefore, honor her and remember that Myla is her own being with her own thoughts and feelings. She is a child of the universe and has been given many gifts from the Divine so that she can light the way for the future. Therefore, it is important for you to support her and protect her, so that her gifts may blossom and she can make this world better than it was before. It is often mistakenly thought that the Godparents are the ones who shall raise a child in the event that the parents cannot. But this is not so. Godparents are those who promise they will be there to help the child grow spiritually. Theirs is a place in Myla’s life almost like a guardian angel. The promise is one of a physical presence in her life as someone who she knows will always be standing quietly behind her, encouraging her to make good choices, and sharing with her the lessons they themselves have learned along the way. Today Lee and Karen have agreed to become involved in Myla’s life by promising to be there for her should she need support, wisdom, comfort and guidance. They have been chosen by Melissa and Kyle because of their connection with them, and the family. The fact that they have been chosen by Melissa and Kyle is an indicator of their position of trust, and respect within this family. Will you as best as you can, help take care of Myla? May you always know how special you are to Melissa and Kyle that they would ask you to tend to the most precious thing that they have in this world." I would like to invite Mylas’s Grandmother Kathy to come forward to share a poem with us. We had a journey in our mind that day. We watched the years fly, where is our little boy? The pictures that tell a story how you grew so fast. A grown man now who has a family. Finally, he will understand the love we feel for him. In an instant, his world has changed forever. Finding pleasure in everyday things, the world will look brand new. We never thought we could love our little boy more, but on this day when he placed our grandchild in our arms we swear we do. We realize what a gift we have received. Our child's child amazed as we kiss her soft cheek. We will reach for our son's hand, to offer encouragement and support. Yesterday's memories tucked away in our heart. Amazed by the love we have for both of them. A part of our souls he now passes on to her. That my son, is the key. We couldn't be happier that Myla Brinn is here as part of our family. We wish you the best of everything in your lifetime. may you know what it is to love.....to love and be loved in our Family. And now I would like to invite Marylou, Myla’s Nana Mare to share a poem with us. Today we officially welcome you. May you continue to bring great joy to your parents, your grandparents, family, friends and to all those who come to know you. May beauty delight you and happiness uplift you. May you build a ladder to the stars and climb every rung. May you grow to be righteous, may you grow up to be true. May you always know the truth, and see the light that's surrounding you. May your hands always be busy, and may your feet always be swift. May your heart always be joyful and may your song always be sung. Thank you Melissa for the gift you gave to me. A happier grandmother the will never be. This little girl is a carbon copy of you. These precious moments you know won't last. You'll be astounded by how fast time flys away. As wonderful as the daughter you have been to me. That for you and Myla can express my love. Officiant to grandparents: May you always be aware of how special the extraordinary relationship of trust and mutual enjoyment between child and grandparent is. (I will address the new baby and I will use the blessed water with roses to bless the top of her/his head, her/his forehead, her/his heart, both her/his hands and both her/his feet). I congratulate Melissa and Kyle on the birth of their baby, and the Godparents on their willingness to share with them the care and concern for the welfare of Myla.